The strangest world you've probably never heard of is located not that far from Earth. Indeed, it's part of our own solar system, orbiting friendly, familiar Saturn  part of the planet's giant swarm of 62 moons. Known as Enceladus after the mythological Greek giant, the moon was discovered by astronomer William Herschel in 1789 and is nothing short of a cosmic fantasyland. Brilliantly white  it reflects almost 100% of the light that strikes it, compared with just 12% for our own moon  Enceladus is also petite: just 310 miles (500 km) across. Its brilliant reflectivity is owed to its frozen surface, which is forever being swept clean and repaved by sparkling geysers of ice regularly emitted by the moon. So powerful is this so-called cryovolcanism that as Enceladus circles Saturn, it leaves a trail of crystals in its wake like a steamship chugging smoke from its stack. This icy exhaust in turn helps feed Saturn's elaborate ring system. The only thing a looking-glass place like Enceladus lacks is life, and at the moment there's no evidence that the moon is home to any biology at all. But a paper just released in the journal Nature brings even that remote possibility at least a little bit closer. According to the new findings, it's now more certain than ever that Enceladus is home to a vast ocean of saltwater just beneath its frozen rind  and it's in oceans similar to that that life emerged here on Earth. The surprising conclusion is the result of a new analysis of data gathered by the Cassini spacecraft, which has been orbiting Saturn since 2004, barnstorming its rings, its moons and the planet itself. On several occasions during its mission, Cassini has flown close to Enceladus, as well as through the vapor plume it leaves in the rings. On all of those occasions, the spacecraft sampled the chemistry of Enceladus' exhaust, and each time it tasted salt. That by itself is tantalizing  at least when you're looking for organics  but it by no means seals the biological deal. Salt can form in space when vapors nucleate down from the gas phase to the crystalline phase too, which would mean that none of it actually came from an Enceladan ocean. But not all of the salt found in the flybys was created equal. The icy vapor sampled out in the ring region had relatively low concentrations of very light salt crystals, while that sampled near Enceladus had lots of heavy, complex salts  and that fits the ocean model perfectly. Salts form in oceans as a result of prolonged contact with subsurface minerals, which dissolve in the water and then crystallize. When cryovolcanoes blast some of that water away, the heavy salt grains require a very high ejection speed to travel very far. The energy of such a blast cannot be sustained for long, which means that the saltiest ice never travels far from the moon itself. The crystals that soar up and out to the rings are the lighter ones with little, if any, oceanic salt. 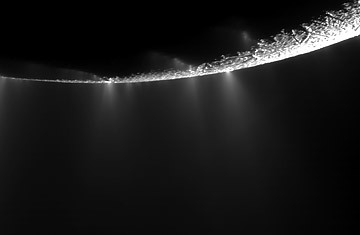 "There currently is no plausible way to produce a steady outflow of salt-rich grains ... other than [via] saltwater under Enceladus' icy surface," said lead author Frank Postberg of Heidelberg University, who is also a Cassini team scientist. What makes this theory especially promising is that if the Enceladan ocean is going to produce life, it has all the time it needs to do so. A little moon so deep in space ought not be able to keep a water ocean from freezing, since it is too distant from the sun to feel any solar heat and too small to have a molten or sufficiently radioactive core. But two of Enceladus' sister moons, Tethys and Dione, provide some help. Every time those nearby satellites fly by, they give Enceladus a gravitational pluck, causing it to flex and stretch slightly. This tidal pumping generates a lot of heat  in the same way that a wire hanger can grow too hot to touch when you bend it back and forth rapidly. That not only keeps the water liquefied and, perhaps, warm, it also leads to the volcanic geysers that feed the rings. A world that literally has a pulse just seems like it ought to have life, and the investigators themselves are showing an uncharacteristic willingness to say so. "This finding is a crucial new piece of evidence showing that environmental conditions favorable to the emergence of life can be sustained on icy bodies orbiting gas giant planets," said Cassini project scientist Nicolas Altobelli of the European Space Agency. That may be an awfully guarded way to make so exciting a point, but in scientist-speak, it's practically high-fiving ET. See TIME's special report "Space & Astronomy."